Unlike frequent flyer miles, hotel loyalty programs offer rewards that can be much easier to use, and are often more valuable. For example, most hotels charge taxes and fees based on the rate paid, so you can typically complete an award stay for absolutely no cost at all. Nevertheless, it's still necessary to learn some techniques about using these points, in order to realize the most value from them. One of the reasons that hotel points can be more valuable than airline miles is that many hotel programs have no blackout dates or capacity controls. This means that any available unsold standard room can be paid for using reward points. Major hotel chains with this policy include Hilton, Hyatt and Starwood (which include Westin, Sheraton, and other brands). In contrast, Marriott and IHG (Intercontinental, Holiday Inn, and others), will only make a percentage of their rooms available for award nights, so you may not be able to redeem awards during peak times. 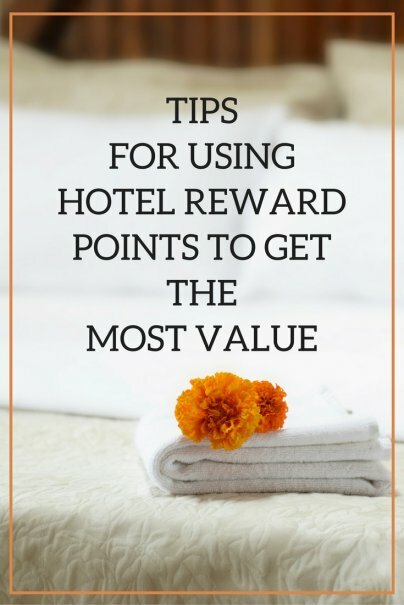 Before you decide to commit to a hotel rewards program, you should examine the award chart, taking a close look at how many points are needed for an award night at properties you might want to visit. Then consider the ways you would be able to earn points and determine whether reaching the number of points needed for free stays would be realistic. If you have a limited number of points, and will be only be able to use them for some of your stays, there are a few ways to stretch them further. The first is to compare the cost of the room with the number of points it requires, and save your points for the times you are getting the most value. For example, if you are going to a convention or another event with a negotiated rate, then you are unlikely to receive superior value by using your points instead. If however, you are staying at a resort area during a holiday or another peak time of the year, this may be the best way to use reward points. In addition, there are programs like Starwood and Hyatt that offer "cash and points" options that can allow you to effectively buy points at a reasonable rate. There are some times when a hotel rewards program will not let you redeem points for an award stay. Sometimes this is due to the chain's policy of blackout dates or capacity controls, while other times a hotel that boasts none of these restrictions will still fail to offer an award room when it still has rooms for sale with cash. In these cases, it can help to call the hotel chain and try to have them override these restrictions. While this technique would never work with airline frequent flyer programs, hotel programs tend to be far more flexible and customer friendly. There are few things nicer than staying in a luxury hotel without having to pay for it. By earning the most valuable reward points available, and spending them wisely, you can find yourself relaxing in luxury in no time.